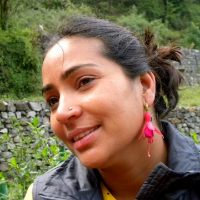 Shashi Bahuguna started trekking with her husband in 2004 and thoroughly enjoyed it. After doing several high and low attitude treks she decided to take it seriously. She did all her courses like the basic and advance Mountaineering Course as well as the Search and Rescue Course from the Nehru Institute of Mountaineering. She also worked with several adventure sports companies. While working she climbed several peaks like Banderpunch, Bhagirathi II (twice), Rudugaira, Thelu and many others. She converted her passion into her profession and in 2014 she started her own company called Bohemian Adventures, with her partners. Mountaineering is an art of climbing a mountain using different skills like endurance of walking, rock climbing, snow craft and ice craft. "I started trekking with my husband in 2004 and enjoyed it thoroughly. After doing several high and low attitude treks I decided to take it seriously. I did all my courses like basic, advance, search and rescue from Nehru Institute of Mountaineering and also worked with several adventure companies."